Falcone's after a cat, there's a canary and two bats, a guy who's Kingpin fat, and we're introduced to somebody's brat. 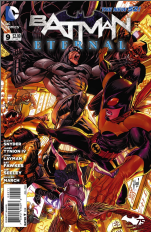 Welcome to issue 9 of Batman Eternal, where all Asians are obviously the same kind of Asian, a super villain wants to make some craaaaaaaaaazy money, and women fill out leather suits like Bechdel never even existed. A quick DC wikia search will tell you why this issue is super special, folks. First, I have to plead ignorance on this, but I'm not super familiar with the villain Roadrunner. I know he was in Snyder's Black Mirror storyline but he didn't leave a huge impression on me. Apparently he's got a tricked out taxi, though, which he uses to get Commissioner Forbes to a rendezvous with our suit-on-top-of-wifebeater-wearing crime boss villain dejour. 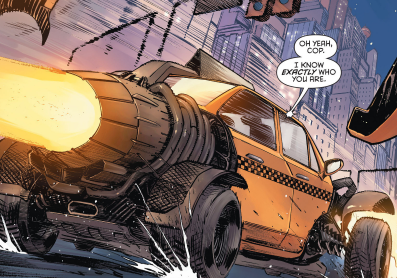 I wonder if this guy just parks in random places throughout Gotham from time to time, waiting for somebody to mistake his cab for a real lone, and then just blasts off with them. It's sort of like that cash cab, but with horrible whiplash. I wonder how many people got into that cab before Forbes finally did, and if they had to pay for the ride at the end. Anyway, our favorite Frank Miller-created criminal (other than those two robot kids or Crazy Steve) seems to be in fits over Catwoman, who's going out of her way to hit Falcone's organization. Forbes sets a trap that Selina should have been too clever to fall for and is set upon by the police and Falcone together. The Roman has a real hate on for Selina, which goes way back to now-out-of-continuity Batman: Year One, when she scratched his face, leaving huge, ugly scars that would have realistically healed better than that. 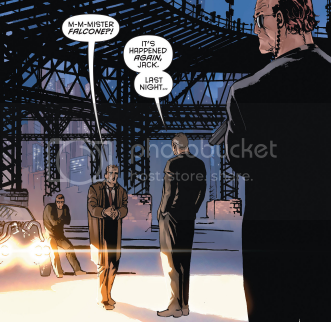 Though Loeb killed Falcone off in The Long Halloween, with Zero Year being different from Miller's Year One, Two-Face's origin being connected to different gangsters, and Falcone still being very much alive, circumstances behind their vendetta against each other must be different. "... I had a dream about you. In this dream, I was dancing right beside you." But the main meat of the issue takes place in Hong Kong, where Batman does investigating that he could have just sent other people to do, trying to figure out why Falcone abandoned his nest there to return to Gotham. While in a city that DC seems to think is still part of the British Empire instead of, you know, China, he meets with Mr. Unknown, the Batman of Japan, because of course, in China, you meet with the Japanese Batman, because the Japanese and the Chinese are interchangeable, right DC? "Where's that Breaking Bad guy? I totally want his autograph!" Surely Batman couldn't have met with some Chinese agent, like perhaps some kind of... Chinese-American trained assassin girl who was perhaps Batgirl for a time? No? I guess she doesn't exist anymore. Maybe he could have teamed up instead with the character who was once her mother, but I guess Shiva is... I don't know, what are they doing with Shiva now? 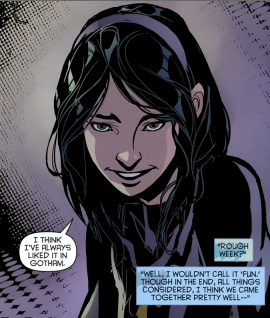 Cassandra Cain: last seen about to mack on Tim Drake. Maybe. But wait, who's this? Is there some hope my Black Bat, my gorgeous body language expert, Batman's official East Asia representative, could be here? Who is this mysterious young lady leaping around, fighting over who takes down Sheng Fang? Could it be? I mean, she looks a little different... no, no that can't be her. 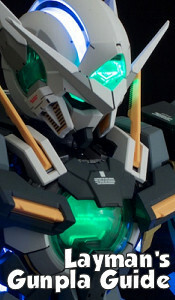 Who is it? Oh, why it's none other than Gerry Conway's classic character, Julia Remarque, also known as Julia Pennyworth! She's Alfred's daughter. Back in the 80s, Pre-Crisis, era, Julia Pennyworth was introduced as the daughter of Alfred and a French Resistance fighter, Mademoiselle Marie. Julia was brought up by Marie and another man, Jacques, who died, prompting Julia to find her biological father who was, of course, in the employ of Bruce Wayne. She was in the comics for five years before being erased from continuity for decades, but frankly, she hardly made an impression. She was in Doug Moench's classic Black Mask story for a couple of pages, though. "Seriously, I expected Cassie myself." I... really wish it had been Cassandra Cain instead, somehow. 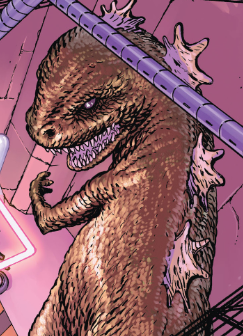 Not that I don't appreciate Julia coming back into canon, this whole Hong Kong bit is a bit of a tease, since Black Bat was specifically stationed in Hong Kong just before the New 52 changed things. Can't she be some street urchin there who Julia is raising, or something? I want my Cass, and I want her now! You brought back Stephanie Brown, Snyder, have the sense to bring back the better character. Baby, don't hurt me, no more. Next issue: Old MacDonald had a farm, E-I-E-I-OH NO!